Virtually every item in this collection is suitable for free name drop. Dollibu offers a beautiful and stylish plush line of travel accessories that includes travel pillows. CoTa Global, the preferred supplier in the souvenir and gift-ware industry, has been in business for nearly 15 years and continues to offer new, unique and outstanding products. Dedicated to offer competitive pricing, they constantly offer promotions year round; currently CoTa Global is offering over 30% off on clearance items. 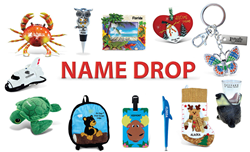 As your first resource to innovative and custom products, they offer a free name drop service to add your business name, logo, design and ideas to virtually any of their products ranging from plush, décor, jewelry, travel and more. This service is completely free with minimum purchase and comes with quick turnaround to get these stocked in your store. Some of their collections include: Dollibu offers a large selection of high quality and affordable plush products including children's bags, hats, notebooks, pens, magnets, key chains, and stuffed animals. Each piece is made with high quality thick and super soft plush fabric fur. Dollibu also offers a beautiful and stylish plush line of travel accessories that includes travel pillows. Virtually every item in this collection is suitable for their free name drop. Taggage! is their exclusive line of fun and unique luggage tags made from durable silicone materials. The tags make travelling easy for quick luggage identification. Each tag features a clear window display with contact information. The colorful designs are raised and give a cool 3D effect. Designs range from wild animals, a space theme, emojis, and more. Taggage! luggage tags can be clipped to backpacks, sports bags, golf bags, and more. Virtually every item in this collection is suitable for their free name drop. Cheers offers beautiful and unique selection of high quality and affordable wine products that will delight you with wine country charm including metal and glass wine stoppers, metal wine charms, and wine bottle openers. Collections range in a large selection of themes, colors, and designs. Each piece is modern and practical and designed to last. Virtually every item in this collection is suitable for their free name drop. This year, they introduced a new nautical inspired home décor and accent pieces that include throw pillows, photo frames, and wall décor items including decorative yet functional wall hooks, wall art, and more. Other new accent designs for the home include, resin coral reefs, star fishes, wooden buoys, and more. Virtually every item in this collection is suitable for their free name drop. CoTa Global continues to offer their ever popular puzzles that include standard jigsaw puzzles, peg puzzles, raised puzzles, and 3D puzzles all in various styles and scales. Their puzzles come in a range of unique designs, difficulties, and suitable for a large range of ages. All of their puzzles meet USA Safety Regulations. Their popular line of magnets come in a large range of designs including plush magnets, bobble magnets, springy magnets, bottle opener magnets, sparkling magnets with rhinestones, and this year they introduced a new line of nautical inspired resin magnets. Virtually every item in this collection is suitable for their free name drop. To learn more about CoTa Global contact us at 818.991.9245, email customerservice(at)cotaglobal(dot)com.